Pockie Ninja, a new MMO brawler inspired by the Naruto and Bleach manga series - both of which were inspired by comics. Making it the worlds first comic series inspired by events inspired by series' that were inspired by comics... possibly. 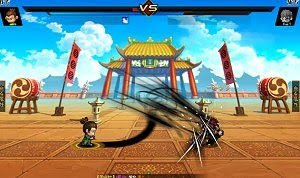 Using pocket-sized versions of famous anime characters, browser-based brawler Pockie Ninja allows players to take on the role of their favourite heroes and villains from the Naruto and Bleach series', engaging in beautifully animated arena fights while questing to save Angel City from an army of evil demon warriors.